Das MaKey MaKey-Board ist eine kleine Platine, mit dem sich leitfähige Objekte in Computertasten umwandeln lassen. Innert kürzester Zeit lassen sich damit kreative, auf Berührungen reagierende Installationen herstellen: Musikinstrumente, Computerspiele und vieles mehr! 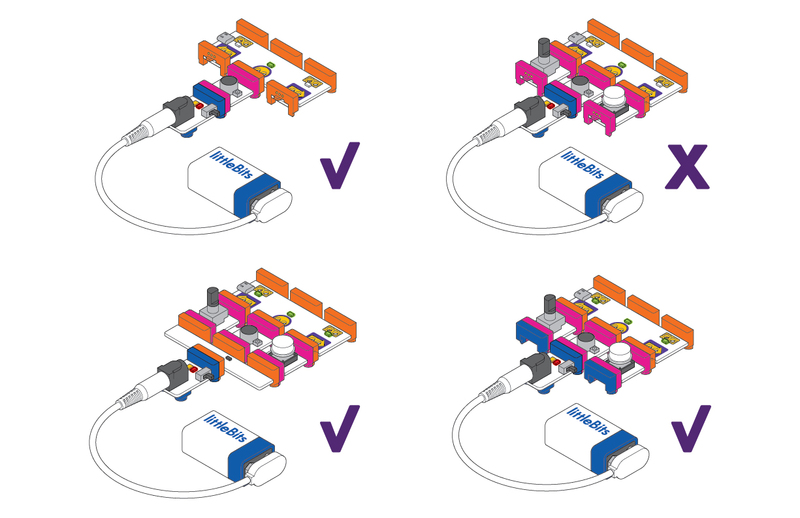 Dies ist ein Ergänzungsset zum Littlebits Premium Kit. 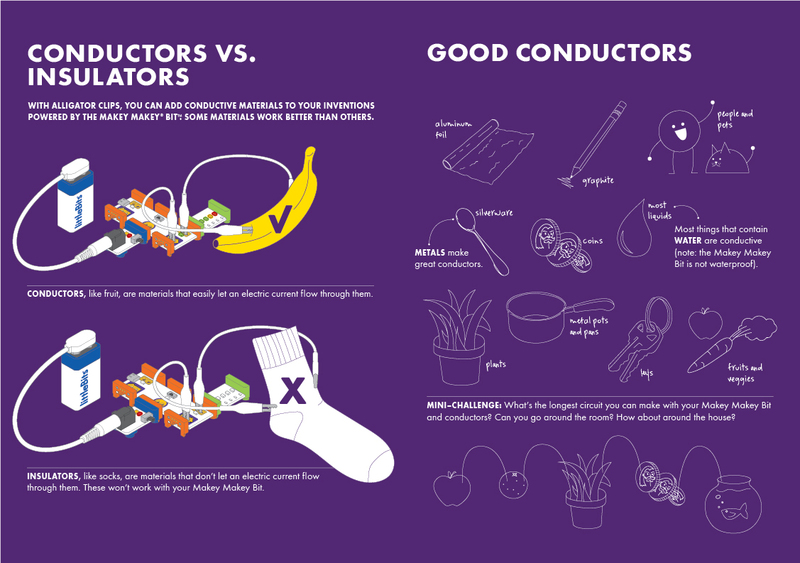 The MAKEY MAKEY Bit turns everyday conductive objects (like bananas) into triggers that control your circuit and even your computer. You can connect the MAKEY MAKEY Bit to these objects using alligator clips. When you connect the MAKEY MAKEY Bit to your computer with the micro USB cable it can act like a keyboard or mouse, controlling LEFT ARROW, RIGHT ARROW, and SPACE/ CLICK. For example, when you touch the SPACE/CLICK pad and an EARTH pad, it is the same as pressing the spacebar or left click on your mouse. The MAKEY MAKEY is able to turn everyday objects into touchpads by using the object or conductive material to complete a connection between either one of the EARTH pads and any one of the three keypads (LEFT ARROW, RIGHT ARROW, SPACE/CLICK). To get a quick sense of how this works, hook up a power Bit to any of the three input bitSnaps of your MAKEY MAKEY Bit, and turn the power on. Place one finger on the EARTH pad, then another finger on any of the three keypads – the signal indicator (small LEDs below each keypad) for the corresponding keypad should light up, because you are conductive! The MAKEY MAKEY Bit can run on both the 9V(p1) and USB(p3) power Bits. The power Bit can be connected to any of the three input bitSnaps on your MAKEY MAKEY Bit, but will only power the input Bits that it is snapped to. If you want to power all three inputs with a single power, you will need to use a fork or powerSnaps. The MAKEY MAKEY Bit does not draw power through its micro USB port – it will require a power input when connected to a computer. Using your alligator clips, you can connect your MAKEY MAKEY Bit to almost anything. Attach an alligator clip to one of the EARTH pads and another alligator clip to any one of the three keypads (LEFT ARROW, RIGHT ARROW, SPACE/CLICK). Attach the free ends of the alligator clips to objects and materials around your household to see if they are conductive. 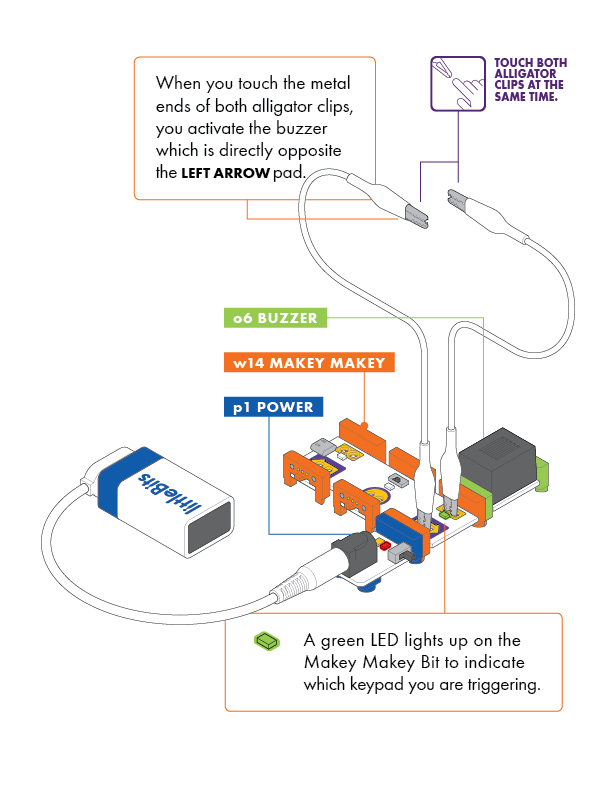 Keep in mind that touching the free end of the alligator clips with your hands will complete a connection, triggering the MAKEY MAKEY Bit – this might make you think an object is conductive, even if it isn’t. All metals are conductive in varying degrees of sensitivity. Aluminum foil and aluminized tape are especially handy for making conductive surfaces. Most fruits and vegetables are also conductive because of the water inside them, which means you might have to poke the alligator clips into the fruit or vegetable to use it as a touchpad. Water is also conductive, but keep in mind that the MAKEY MAKEY Bit is NOT waterproof. Any kind of insulated wire is also great for giving your MAKEY MAKEY Bit some reach. This is particularly useful if you are working on a larger scale, and want to have touchpads set up throughout a larger space. Instead of wire, you can also use conductive thread, which you can easily find online. The thing to keep in mind about conductive thread is that it is un-insulated, which means that any contact with any point on the thread will complete a connection, and trigger the MAKEY MAKEY Bit. 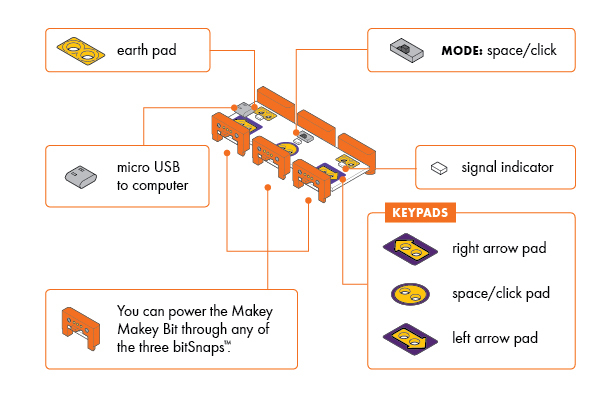 When using the MAKEY MAKEY Bit, note that the keypad you select (LEFT ARROW, RIGHT ARROW, SPACE/CLICK) will correspond to the output bitSnaps directly across from those keypads. You can use the MAKEY MAKEY Bit to trigger any output Bits. One thing to keep in mind is that your output will be active only while you complete the connection between the EARTH pad and one (or all) of the three keypads (LEFT ARROW, RIGHT ARROW, SPACE/CLICK) – the output stops as soon as you break the circuit. For added complexity and interactivity try adding input Bits between the MAKEY MAKEY Bit and the output Bits you want to activate. In this way, you’ll only be able to activate the outputs by both completing a connection on the MAKEY MAKEY Bit AND triggering your input Bits at the same time. Also make sure to visit MAKEY MAKEY’s website to check out more tips and tricks, as well as some awesome computer programs and games that can you can using your MAKEY MAKEY and other Bits. 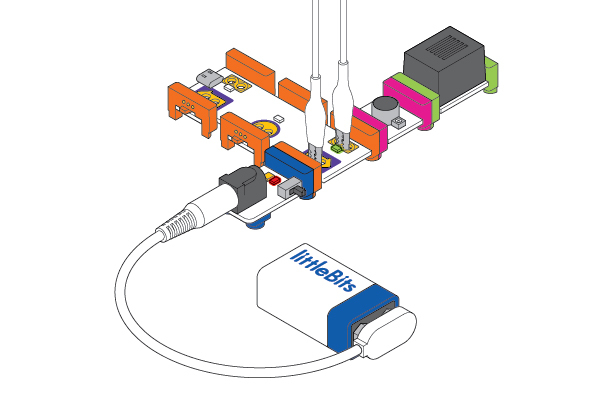 Weiterführende Links zu "littleBits Makey Makey"
Weitere Info "littleBits Makey Makey"
Kundenbewertungen für "littleBits Makey Makey"